WEB 3.0 is here !! Yes , the next generation web , which u called “Semantic web” is coming. The Web is entering a new phase of evolution. There has been much debate recently about what to call this new phase. 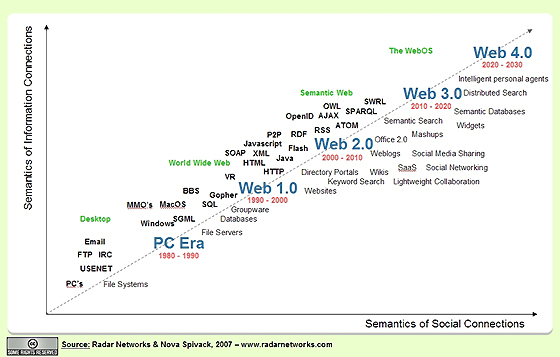 Some would prefer to not name it all, while others suggest continuing to call it “Web 2.0”. However, this new phase of evolution has quite a different focus from what Web 2.0 has come to mean. The term Web 2.0 was never clearly defined and even today if one asks ten people what it means one will likely get ten different definitions. However, most people in the Web industry would agree that Web 2.0 focuses on several major themes, including AJAX, social networking, folksonomies, lightweight collaboration, social bookmarking, and media sharing. While the innovations and practices of Web 2.0 will continue to develop, they are not the final step in the evolution of the Web. In fact, there is a lot more in store for the Web. We are starting to witness the convergence of several growing technology trends that are outside the scope of what Web 2.0 has come to mean. These trends have been gestating for a decade and will soon reach a tipping point. At this juncture the third-generation of the Web will start. Rise of More Intelligent Agents. Web 3.0 will be more connected, open, and intelligent, with semantic Web technologies, distributed databases, natural language processing, machine learning, machine reasoning, and autonomous agents. Yes! Finally something about next. I just want to say I am just very new to blogging and certainly loved your blog. Almost certainly I’m planning to bookmark your site . You actually have fantastic stories. Bless you for revealing your web page. the same old rehashed material. Excellent read! I’ve saved your site and I’m including your RSS feeds to my Google account. Hi Fine wewebsite. Accomplish you want to guest distribute in my own someday? If that’s the case delight allow me get by means of e-mail otherwise emphatically react this kind of observe as I enrolled in notices and definately will realize ought to you. Smart Hub :Samsung Smart Social Tv Experience Coming ! !